At the pinnacle of the history recorded in the Book of Mormon, readers find in 3 Nephi the story of the resurrected Jesus Christ who descended from heaven to teach the people at the temple in Bountiful. The magnitude and sacred content of 3 Nephi 11–26 has brought BYU Professor John W. Welch to call it the “holy of holies” of the Book of Mormon. At the temple, Jesus taught a version of the Sermon on the Mount, a set of teachings that contains many subtle references to the temple. Welch explained how the Sermon on the Mount (and 3 Nephi’s “Sermon at the Temple”) presents principles in a way that can be seen as an escalating path of ascent, leading adherents towards heaven. If entrance into the presence of God is the end to which the Sermon on the Mount and the Sermon at the Temple both lead, readers should consider the profound connections between the heart of 3 Nephi and the inner sanctum of the temple. With this perspective in mind, one can make a comparison between the holy of holies of the ancient temple and the events recounted in the book of 3 Nephi. The following table represents a selection of relevant elements. Although the scriptural passages regarding the temple and the work of the high priest in the Old Testament can be somewhat obscure and are symbolic of future realities, the account of Christ’s appearance at the temple in 3 Nephi is a living manifestation of those ancient symbols. Studying the Sermon at the Temple (or the Sermon on the Mount) from this perspective can give one a greater appreciation for the Sermon and also for the temple, both ancient and modern. For Latter-day Saints, going to the temple is a sacred experience; it offers an opportunity to step out of the world and into the presence of divinity. 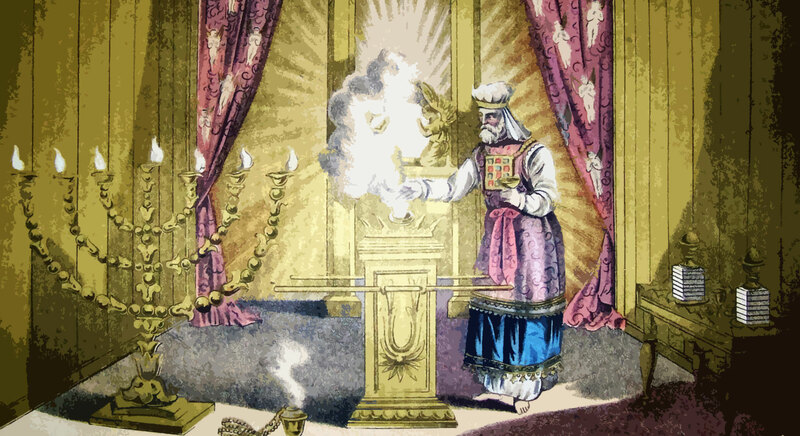 In ancient Israel, the Holy of Holies was a sacred space—so sacred that only the high priest was permitted to enter—where the Lord dwelt. The sacred record in 3 Nephi invites all people to come unto Christ and be perfected in Him: “Therefore I would that ye should be perfect even as I, or your Father who is in heaven is perfect” (3 Nephi 12:48). Seeing 3 Nephi this way can help all people to envision coming into the holy presence of God. When 3 Nephi is seen as the holy of holies, reading it becomes an opportunity for readers to disengage the world and to consecrate their lives to loving and serving the true and living God. We learn from its pages: “For where your treasure is, there will your heart be also. . . . No man can serve two masters; . . . Ye cannot serve God and Mammon. . . . Seek ye first the kingdom of God and his righteousness, and all these things shall be added unto you” (3 Nephi 13:21, 24, 33). John W. Welch, “Seeing Third Nephi as the Holy of Holies of the Book of Mormon,” Journal of the Book of Mormon and Other Restoration Scripture 19/1 (2010): 36-55; also published in Third Nephi: An Incomparable Scripture, ed. Andrew C. Skinner and Gaye Strathearn (Salt Lake City and Provo, UT: Deseret Book and Neal A. Maxwell Institute for Religious Scholarship, 2012), 1–33. John W. Welch, The Sermon on the Mount in Light of the Temple (Burlington, VT: Ashgate, 2009). John W. Welch, Illuminating the Sermon at the Temple and the Sermon on the Mount (Provo, UT: FARMS, 1999). Margaret Barker, The Gate of Heaven: The History and Symbolism of the Temple in Jerusalem (London: SPCK, 1991). John W. Welch, “Seeing Third Nephi as the Holy of Holies of the Book of Mormon,” Journal of the Book of Mormon and Other Restoration Scripture 19, no. 1 (2010): 36-55; also published in Third Nephi: An Incomparable Scripture, ed. Andrew C. Skinner and Gaye Strathearn (Salt Lake City and Provo, UT: Deseret Book and Neal A. Maxwell Institute for Religious Scholarship, 2012), 1–33. Welch, “Seeing Third Nephi,” 40–41. The passages mentioned are 3 Nephi 11:38–39 (“this is my doctrine, and whoso buildeth upon this buildeth upon my rock”) and 3 Nephi 14:24–27 (“I will liken him unto a wise man, who built his house upon a rock”). The image of “the rock” is an ancient symbol associated with both the Lord and the Temple (see, e.g., Psalm 94:22; 71:3; Isaiah 25:4; 28:16; 2 Chronicles 3:1). See Welch, “Seeing Third Nephi,” 45. See also Book of Mormon Central, “Why Did Jesus Say that Some Well-Intended People Would Be Told to Depart? (3 Nephi 14:21),” KnoWhy 205 (October 10, 2016). Welch, “Seeing Third Nephi,” 45. See Welch, “Seeing Third Nephi,” 45–52, for a more complete list. John W. Welch in “3 Nephi Conference Panel Discussion,” in Third Nephi, 381.